Rule of Thumb: Let the cat’s preferences guide your decision making. If your cat suddenly refuses to use the litter box or is jumping in and out without urinating, call your vet. This can be an indicator of a very serious medical issue. Possible medical conditions include (this is not exhaustive): urinary tract infection or blockage, cystitis, diabetes, and bladder stones. Open top or covered litter box , in the end what really matter is that your cat likes it and is willing to use it. If you don’t already know your cat’s preference, you may want to try having both a covered and an uncovered litter box available. Some cats enjoy the privacy of a covered box while others feel claustrophobic. Larger cats will probably prefer an uncovered litter box as it gives them more room to move around and dig in the litter. Humans tend to prefer the covered boxes because they hide the mess. Covered litter boxes also keep more of the litter inside the box (choosing an open litter box with high sides can also help with this). If you choose this option, don’t forget that the cover traps odors inside (which may seem good to you) that may offend your cat. You can keep the odors from overpowering your cat by keeping the litter box clean. There are a ton of different cat litter on the market today. Regular clay litter is the cheapest option, but it will allow urine to sink to the bottom of the box. This means that when you scoop the litter, you will only be removing the feces and the urine will remain in the bottom of the box until you change the litter. As you can imagine, this could create an odor that will offend your cat. On the other hand clumping litter will cause the urine to clump for easy removal. Being able to remove all of the urine and feces when scooping makes the litter box more pleasing to your cat. The downside is that you will pay more for the litter. Clumping litters should not be used with kittens that are younger than 8 weeks because they may eat the litter. Eating the litter does not seem to be a problem with older cats (unless the litter is corn or wheat based). For those that are more environmentally conscious and would like a biodegradable litter options made of recycled newspaper, pine chips, corn cob, silica beads, peanut shell meal, and processed orange peel exist. Some of the litters made of these materials DO come in a clumping formula. Every material has its pros and cons. For example, with silica beads, the beads absorb the urine, but it does not clump and so the urine remains in the box until the litter is changed. Cats seem to care most about the texture of the material. According to a 1990 study by Dr. Peter Borchelt, when given a choice, cats choose fine grained clumping litters the most. Wood chips, grain litters, and recycled newspaper litters were rarely chosen by cats. Smell is also important as cats will not use a litter if they don’t like the smell. Cats are very finicky about their litter. It may take some experimentation to find out what your kitty likes best. You will also need to experiment with the depth of the litter. Some cats will want as much as 4 inches of litter while others will want only a thin layer. 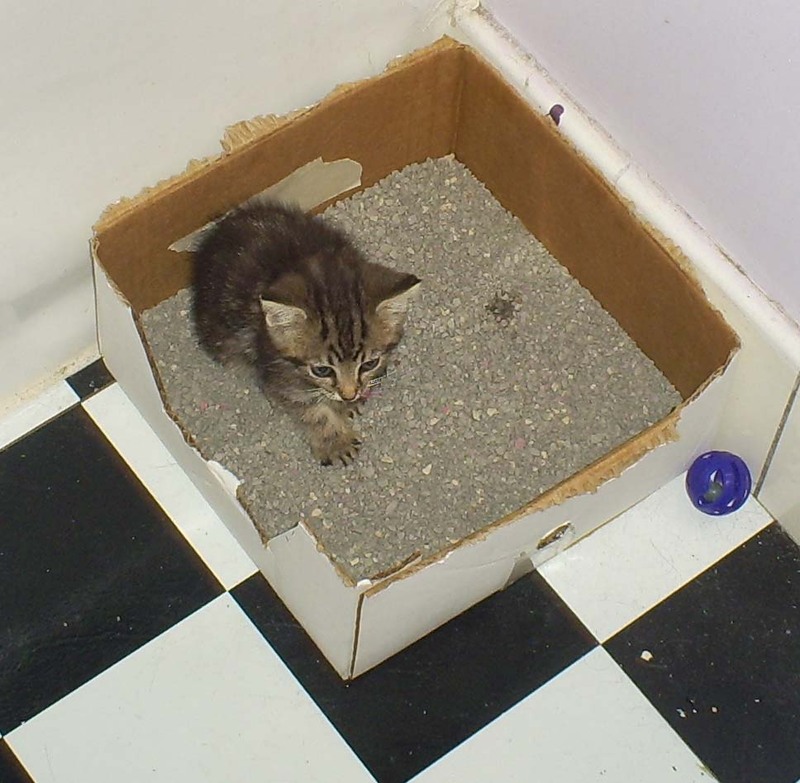 The depth of the litter may be a factor in your cat’s choice to use to the litter box. Note: Cats with asthma may be sensitive to the dust in corn and wheat based litters. All of these tips are very general. You may need to adjust these depending on how many cats you have and how many litter boxes you have. Just remember that a dirty litter box to a cat can be like a outhouse at a crazy downtown festival is to you. Scoop the litter box daily. Change the litter 2 times per week. Clean the litter box with a mild dish soap. Using ammonia based products or products with a citrus scent can turn your cat off to using the litter box. Ammonia actually intensifies the smell of the urine from your cat’s point of view. Sweep and/or vacuum around the litter box frequently. Place the litter box in a place that is convenient for the cat to get to. Kittens, elderly cats, and ill cats may have difficulty climbing up and down stairs. If the litter box is placed in a closet, make sure the door is wedged open so your kitty doesn’t get locked in or out. Do not place air fresheners near the litter box. Cats may not like the smell of the air fresheners and therefore will not use the litter box. Some cats will not use the litter box if it is place too near their food. Do not place the litter box next to a noisy appliance. Cats may not like the noise and, you guessed it, won’t use the litter box. Do not place the litter box next to an appliance that gives off a lot of heat. The heat may make your cat uncomfortable and it will definitely intensify the odor. Sprinkling a small layer of baking soda in the bottom of the litter box before you put the litter in can help absorb some of the odors. However, this isn’t an easy way out of cleaning your litter box frequently. Your cat’s nose is much better at sniffing out those odors, plus the bacteria and actual waste will still be there.